Serra de Daro is a small agricultural village on the link road between Torroella de Montgri and Parlava. It's on one of the back routes up from Palafrugell/Palamos to Figueres avoiding La Bisbal. The village is on the river Daro as it heads north to join the Ter. In the main it is more of a productive farming centre more concerned with the fields and fruit trees that lie around the village than trying to look pretty. In some ways this adds character to the church and older heart of the village. 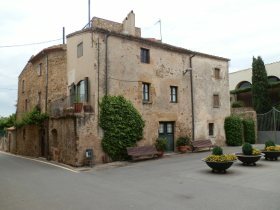 Originally we were heading for a walk further to the north, but as we were driving we noticed the small village of Fonolleres across the plain so not having visited Serra de Daro before we decided to stop and chance for the walk. The landscape is very flat in the immediate vicinity, but not far off is Montgri and there are views to the distant Gavarres and Pyrenees in the distance. From Serra de Daro we head through the village down to the river. 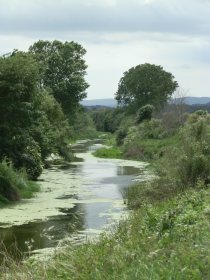 The river Daro rises in the Gavarres close to La Bisbal, so it's not a major river but there is water in the stream and a steady flow through the reeds and grasses. The path follows the river on the north bank, with occasional fords crossing the river to reach a farmhouse on the other side. There's sufficient water flowing over the fords to keep us from trying to cross without getting feet wet. To start the walk is pleasant but not exhilirating, but the sight of kingfishers in the trees above the river enlivens the day, their orange breasts and long beaks clearly visible above us. They're not the only birds either, ducks and moorhen are also on the fringes of the river. Across the fields the view to Fonolleres and Sant Iscle, the other villages we will visit is very clear and we can see out to Parlava and Ultramort in the further distance. Around the corner we skip the first route to Fonollores preferring to keep to the river for another while trying to see more kingfishers and we walk past a huge bank of poppies reaching out towards the field of recently planted corn to the right. We're unlucky and don't see any more kingfishers, so take the next junction to the left past a grand, but seemingly abandoned farmhouse isolated in the fields. The path by the Daro would connect all the way to La Bisbal if we'd decided to continue. Past the fields we reach the outskirts of Fonolleres, the gardens of the houses blooming with roses and other flowers. 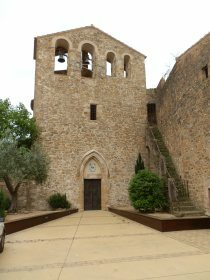 The first main building we come to is almost like a Catalan Palau - a large building in the centre of the village with arches across the top of it's facade to let the air in to the upper levels. We can hear children playing in the Palau garden behind the wall. The village is no more than 4-5 streets, but it is well groomed. The church is unusual in shape with what seems to be a fortification tower at one end, and a bell-tower at the other, and there are other golden coloured stone buildings around the main placa. 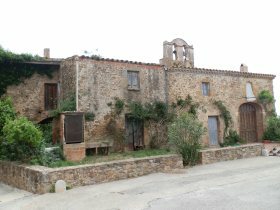 Having completed our brief tour, we walk out on the far side of the village past farmhouses marked as offering Turisme Rural. For masies and farms off the coast it is common to see directions marked to places offering rural tourist getaways - what in the UK would be farmhouse B&Bs, or chambre d'hotes in France. The countryside of the Costa Brava rivals that of the Cotswolds, or the Dordogne, or Tuscany so it's sometimes a pity to find people who only think of the Costa Brava as a 60s seaside destination. Ahead of us, we cross the road and head along a lane towards the fruit trees. The area of the Ter close to Torroella de Montgri is a massive fruit growing area due both to the sunshine and the ready availability of water from the Ter. In places enormous long espalliers full of trees fill the fields, often apples, but also peaches and other warm weather fruit. At this time of year, leaves are returning and there is blossom on the trees. Our lane leads us up to Sant Iscle d'Emporda. It's a small hamlet set on an isolated hill above the plain with a small watch-tower and church. Unlike the groomed Fonolleres, Sant Iscle is more neglected, but in a traditional rustic way reminiscent of rural France, with wild roses climbing around the crumbling door of one old building. The watch tower itself seems to have been built crooked - it's base smaller than it's top and the neighbouring house, which at one time might have been the grand house of the village, is held together with metal beams and pins. Even the church has idiosyncratic lines of stones in it's construction. We walk down off the hill across the road and back into Serra de Daro.